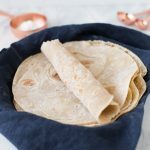 Best Gluten Free Flour Tortilla Recipe-soft, flexible and perfect for packing burritos for school lunches! 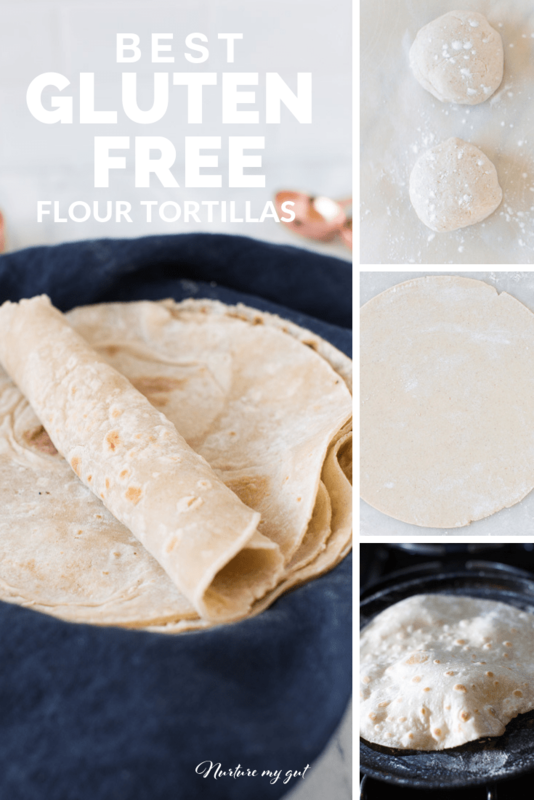 These gluten free flour tortillas are easy to make. 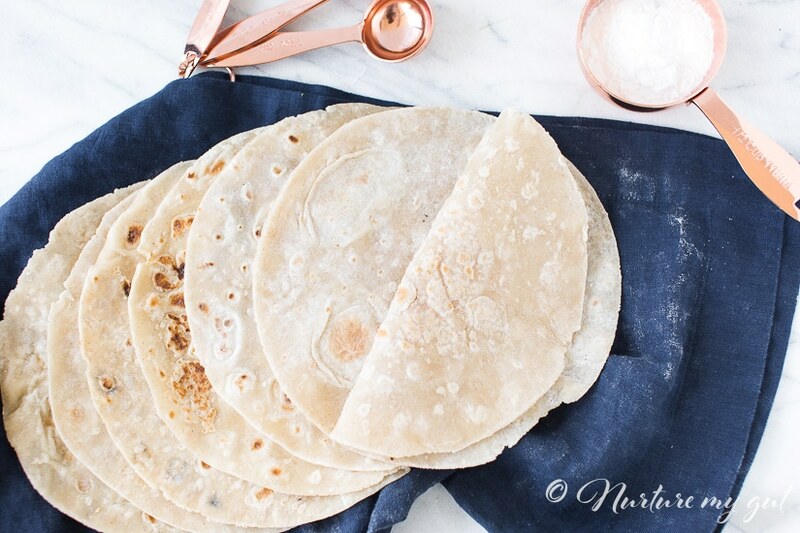 I will show you step by step how to make the gluten free flour tortillas. After mixing together your gluten free flour and wet ingredients, divide your dough into 7 ball of dough. Dust generously with tapioca flour. For thinner tortillas, divide dough into 8 balls. 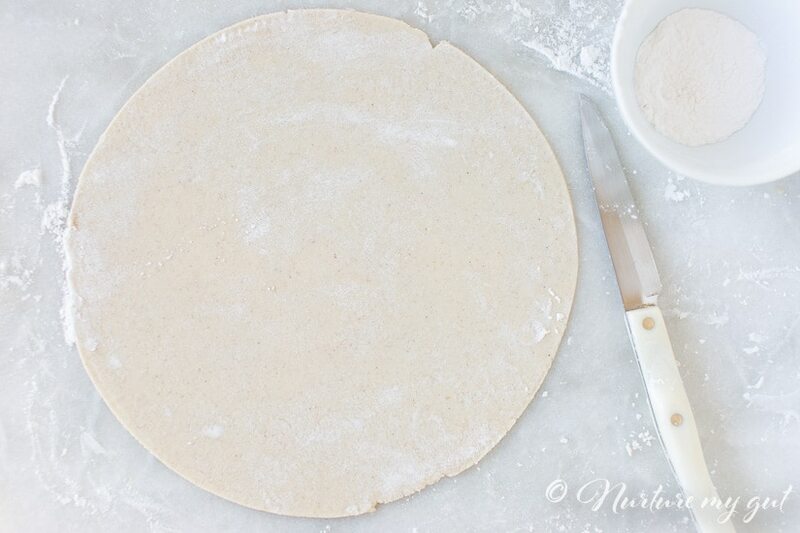 Roll the dough out and place a 9” plate on top and cut out with a sharp knife. Place onto a hot cast iron skillet. I keep my flame on low-medium heat. When you see bubbles begin to form, flip over. Once flipped, gently press on the tortilla. This helps the gluten free tortilla steam through and create more bubbles. I used a lot of tapioca flour so I dusted some off with a pastry brush. 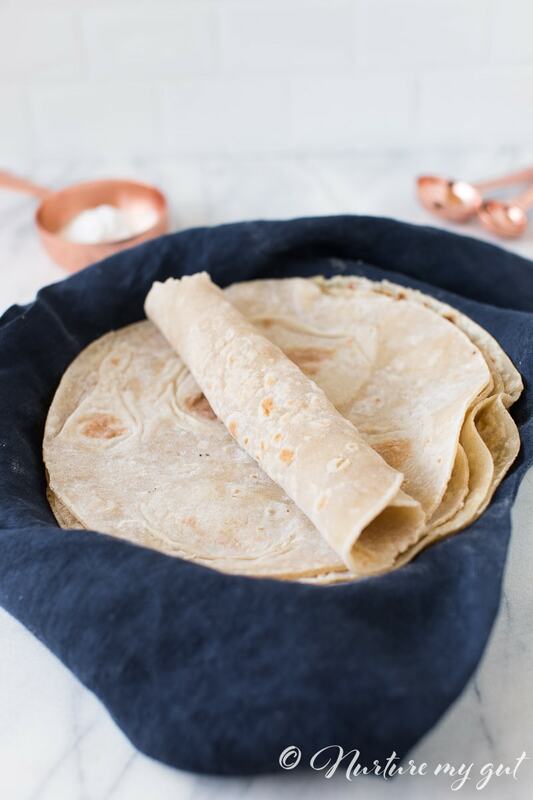 These gluten free flour tortillas are nice and golden. What I like about these tortillas is that they are HUGE! Which makes them perfect for school lunches. Oh what have a nice flavor these gluten free flour tortillas have! 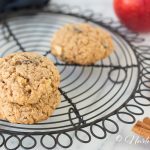 The addition of honey gives them a hint of sweetness that my kiddos really enjoy! 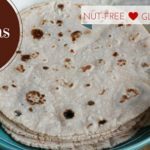 These gluten free flour tortillas are soft and flexible, perfect for tacos, enchiladas, burritos and more! They can hold a lot of food inside! Feel free to load them up! No more missing out on burritos! Gluten free burritos here I come! 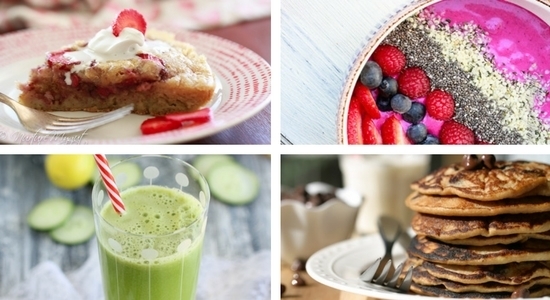 For more delicious healthy gluten free recipes, please subscribe below. You will get my free Paleo Breakfast E-Book as my gift to you and new recipes straight to your inbox! Heat cast iron skillet to medium low heat. Heat water until it is simmering. 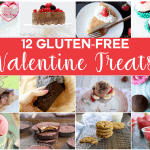 Whisk together gluten free flour, xanthan gum, salt and baking powder. Measure water and stir in oil and honey. Slowly add hot water to flour while mixing. I use a stand mixer, a dough whisk will work too. Mix dough well, it will be slightly sticky. Flour your hands with tapioca flour and separate dough into 7 balls for thicker tortillas and 8 balls for thinner tortillas. Generously flour surface and rolling pin with tapioca flour. 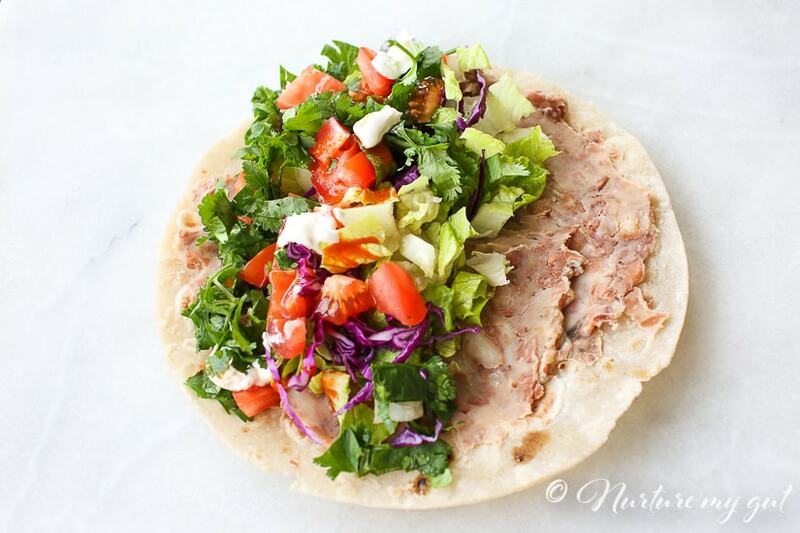 Roll out tortillas to 9” round. 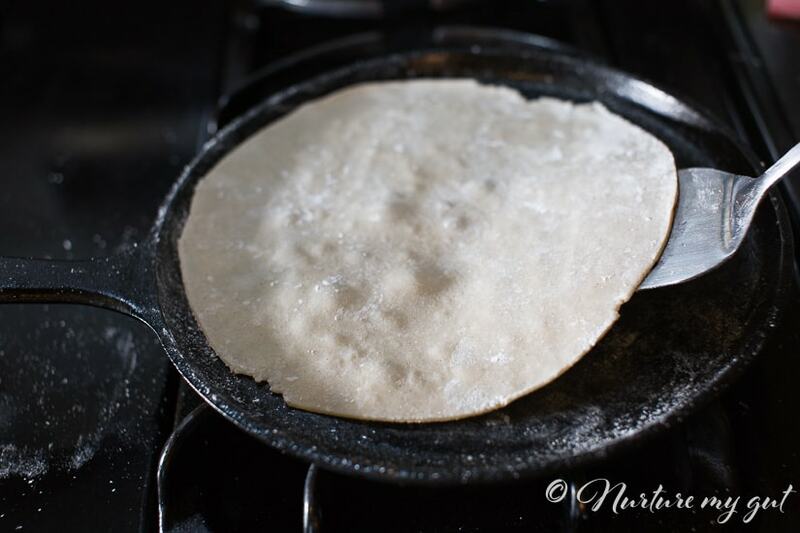 Dust with tapioca flour during rolling and flip so tortillas do not stick to surface. I use a 9” plate to cut out the shape of the tortillas. Then add remaining dough to next ball. 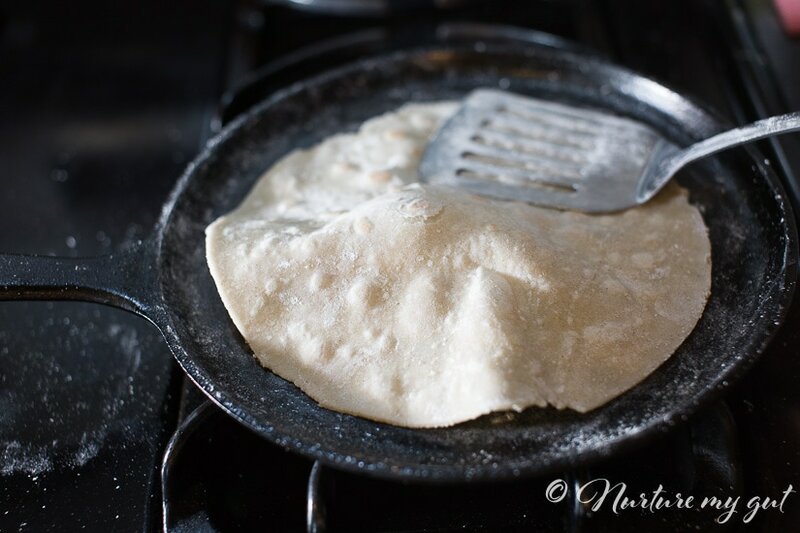 Place tortilla onto hot griddle. When bubbles form, flip with a spatula. 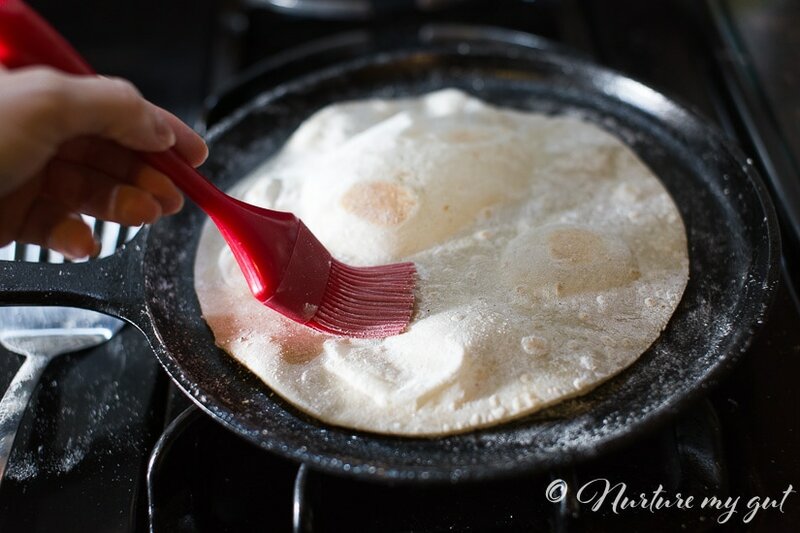 Gently press on tortilla with spatula so large bubbles form. Flip. Tortilla is ready when both sides have light brown spots. 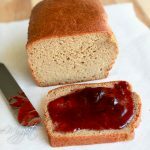 Dust off tapioca flour with a pastry brush. Place tortilla in a tortilla warmer to keep warm. Repeat steps 8-11 until all tortillas are cooked. 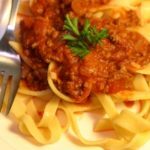 Store leftovers in a large ziplock bag at room temperature and reheat on a cast iron skillet. 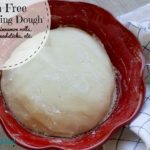 Dough can be made ahead of time and stored in the fridge up to 3 days. That way you can have hot tortillas when needed. 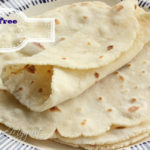 If tortilla begins to burn while cooking, reduce the flame, it is too hot. If tortilla sticks to the pan while cooking, add more tapioca flour while rolling and reduce heat. If you see translucent parts on the tortilla, press down with a spatula so it cooks through, flip and press on same spot. 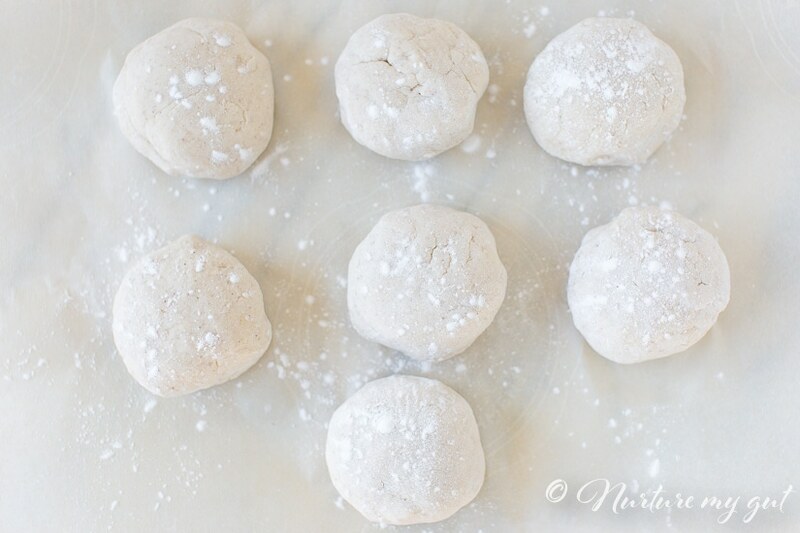 If dough is too sticky, work in a little tapioca flour with your hands a teaspoon at a time. 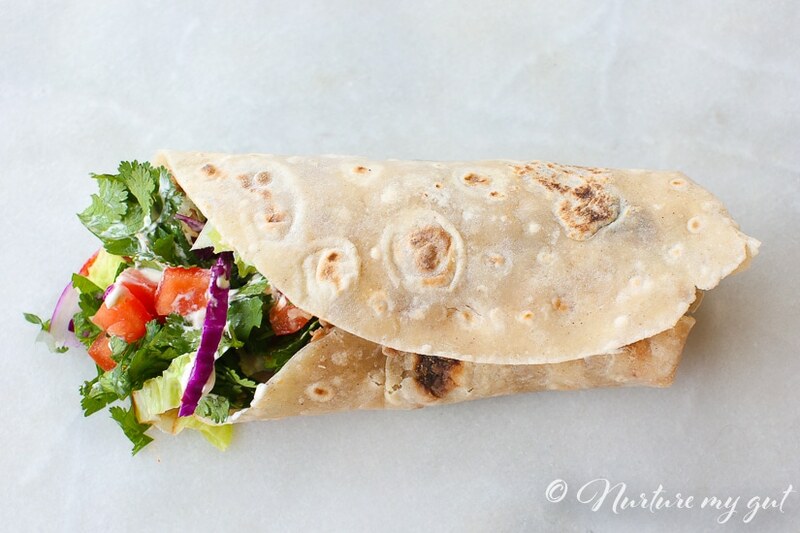 When packing burritos for lunch, wrap in parchment paper and then in another layer of foil. This will keep the tortillas soft and warm. 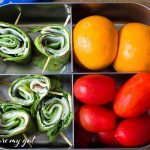 We use these for bean and rice burritos for kids lunches and they hold for several hours. Nutrition data is for 1 tortilla based on 7 nine inch tortillas plus the 3 Tablespoons of tapioca flour for dusting. 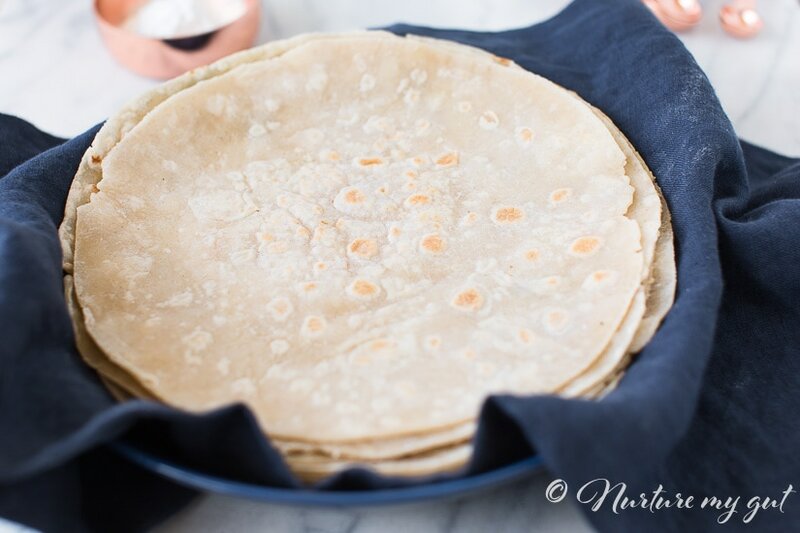 If you make 8 tortillas out of this recipe, then the carbs reduces down to 14.4 grams and the sugars reduce down to 1.6 grams per tortilla. 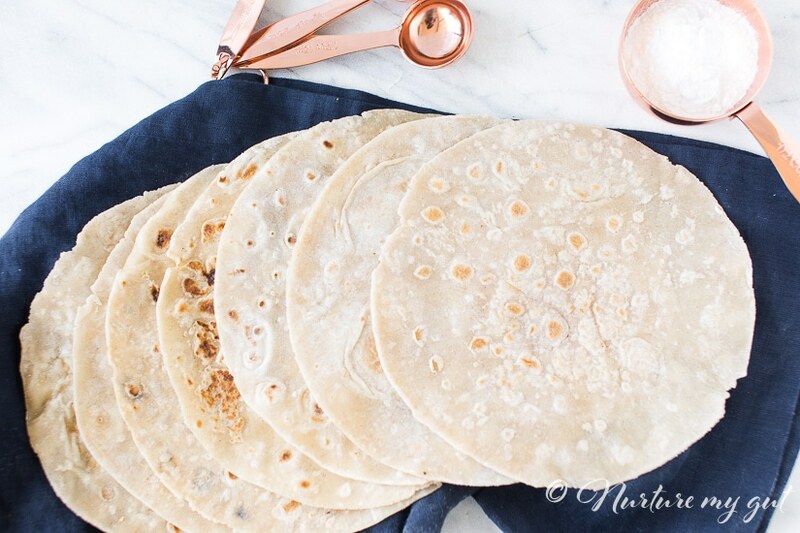 These tortillas are best made fresh so I recommend keeping dough in the fridge until ready to use. 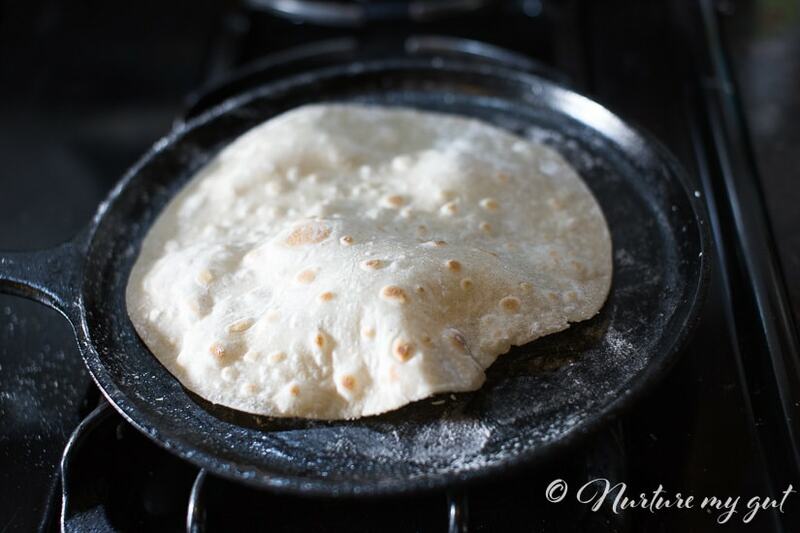 Use a tortilla warmer to keep tortillas warm during a meal. I prefer the round insulated fabric tortilla warmers. 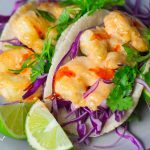 We love tacos at home, plus the kids enjoy it because they get to make their own. I’m definitely going to try and see if I can make these at home, they’re definitely better than the store bought packets I use, mostly out of convenience. Thanks for sharing! Will these tortillas stand up to being baked in sauce – like enchiladas? or do they break down. 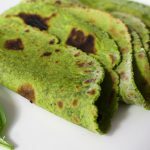 I have tried different Tortilla Recpies, But nothing has worked? 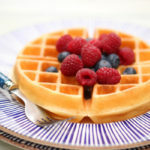 Will try your Recipe! Thank You! Is it necessary to have the honey in the ingredients? If I leave that out, it will change the consistency so, should I just add less flour to make up for that much less moisture? You can leave the honey out, you may just not get those nice brown spots. I would Just add the water a little bit at a time till you get the right consistency. You may need a bit more than the amount required. 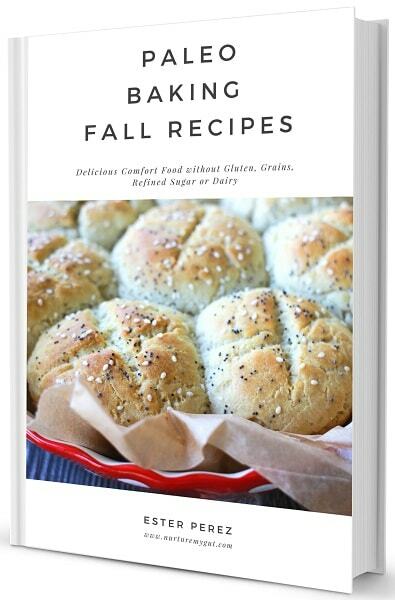 Doesn’t the flour already have xanthan gum? Yes, it already has xanthan gum included. 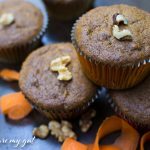 I do not add xanthan gum for baking muffins or cakes but I find it very useful in tortillas to get the soft texture I am looking for.